It is 12:35 AM and I am still up and in the kitchen. I really wanted to get this recipe up on the blog before the holiday in case you’re still wondering what to make for your simanim, but since it’s really late here in Israel and I have a big day ahead of me, I’m going to skip the words on this post. 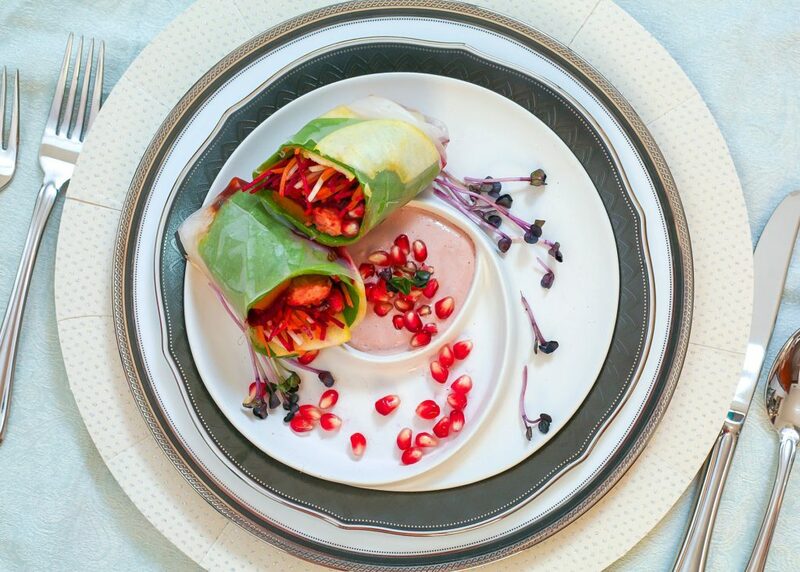 These summer rolls incorporate all of your Rosh Hashanah simanim (symoblic foods) into one stunning appetizer! I took a little liberty with the “head of a fish” siman (symbolic food) and just used fillets of fish. Similarly, some say that sesame seeds fall under the siman for “rubia” (abundance) so tahini paste it is! Other than that, we have our classics: beets, apples, spinach, butternut squash (for the gourd siman), pomegranate seeds, and carrots. It doesn’t get simpler than this! Shana Tova everyone! May we all have a sweet new year! 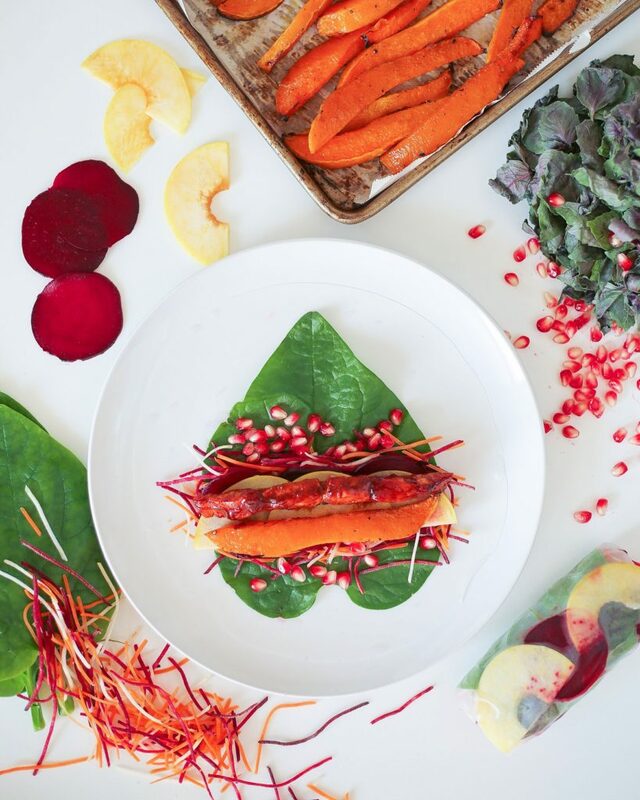 Place the butternut squash onto a parchment lined baking sheet. Drizzle with olive oil, salt, pepper, allspice and maple syrup to taste. Toss to coat. Bake for 40 minutes or until tender. Wash the beets well and pat dry. Wrap them in aluminum foil and bake for 40 minutes or until can easily be pierced with a fork. Remove from oven and once cool, peel. Using a mandoline, thinly slice the beets into rounds. 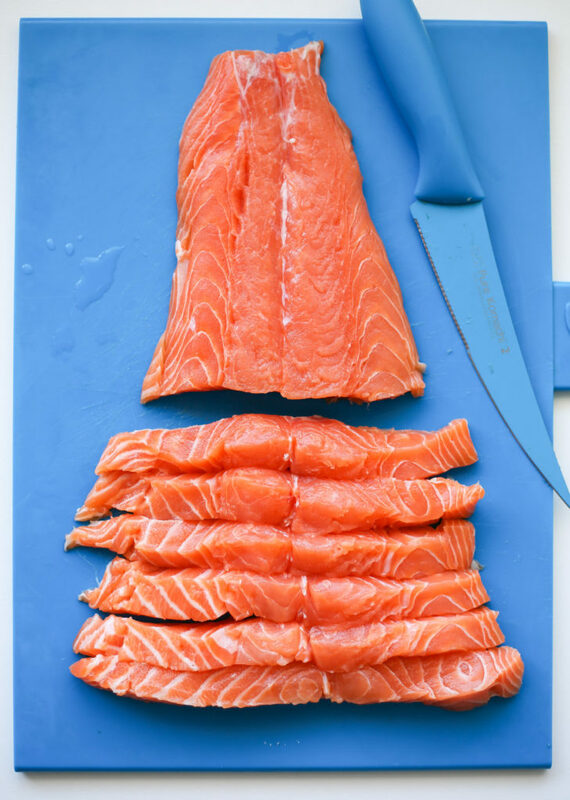 Thinly slice the salmon fillet into thin strips, like matchsticks. 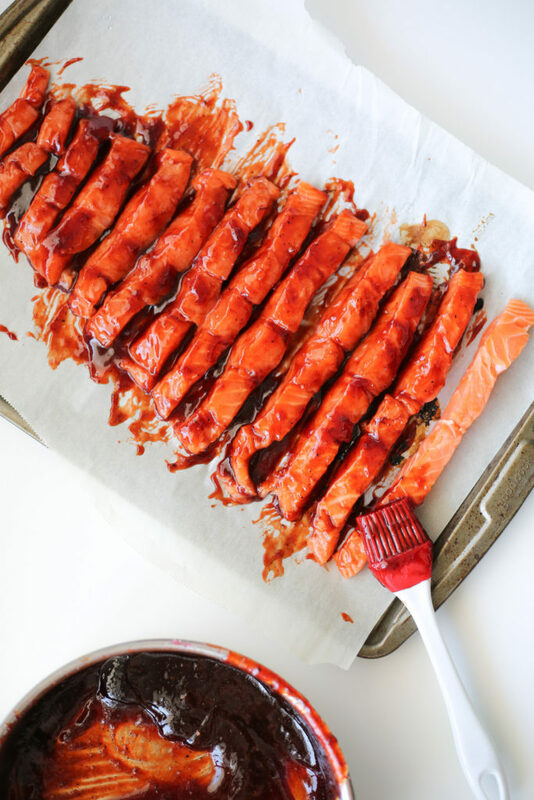 Place onto a parchment-lined baking sheet and baste the fish with the pomegranate bbq sauce liberally. Bake for 15-18 minutes, until flaky. Its time to assemble the summer rolls! For each wrapper, immerse it in the water until it softens, which takes around 1 minute. Watch for it to begin curling. Use both hands to pull it up out of the water, holding it over for a few seconds to drain. Spread it immediately on a rimless plate, making sure there are no folds. Place the spinach leaf at the lower center of the softened wrapper with the pointy part furthest from you. Add on top some of the salmon, butternut squash, beets, apple, shredded carrots and pomegranate seeds. To roll up your wrap, first fold the two sides in and starting from the bottom roll until it's closed and tight, using a tuck and roll method. Place each roll as you finish it on a cookie sheet lined with parchment paper and cover with a damp towel. Continue to do the above steps until you have run out of vegetables or wrappers. 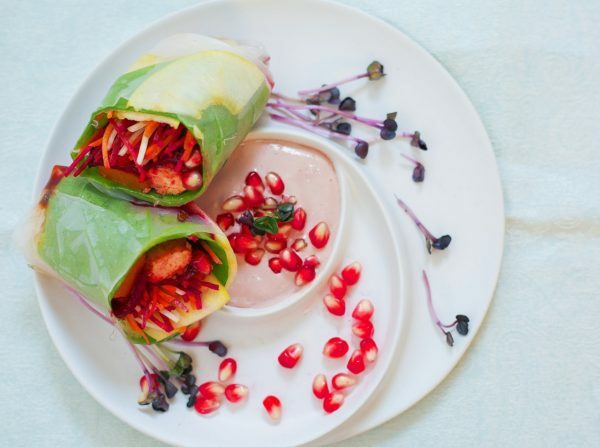 To serve, slice in half on a diagonal with a sharp knife place and serve with beet sprouts and the pomegranate tahini dipping sauce. Place everything into a saucepan and heat up on a medium flame. Bring to a simmer, and simmer for 30 minutes until thickened. Remove from flame and baste onto fish or anything else you would like! Blend everything in a food processor or blender until smooth.